Cheonnyeon Dongan took full advantage of hot favourite Joy Lucky’s misfortune to win the Donga Ilbo Cup at Seoul Race Park this afternoon. Joy Lucky came into the race with 6 wins from her 7 starts to date, her only defeat having come in the Korean Derby. She skipped the Korean Oaks and was entered here instead of in the much more valuable Minister’s Cup next week. She started at odds of 1/3. She looked good to win too. Rounding the final turn Joy Lucky, under Seo Seung Un, was about to make her move when suddenly the horse in front of her, Wild Cat, carried her wide. She recovered but her momentum was gone and she could only manage 4th. Meanwhile the always handily placed Cheonnyeon Dongan cruised to the front and, having picked off longtime leader Eutteum Khan, went clear for victory by just under 2 lengths. Cheonnyeon Dongan (Ecton Park), a 3-year-old filly, was 3rd behind Joy Lucky in the Sports Seoul Cup and 4th in the Korean Oaks at Busan last month. Today’s win was her 5th from 11 starts. Joy Lucky and Cheonnyeon Dongan may meet again in the Gyeonggi Governor’s Cup next month. as good as Cheonnyeon Dongan was today, if Joy Lucky gets a clear run, few will bet on a repeat of this result. 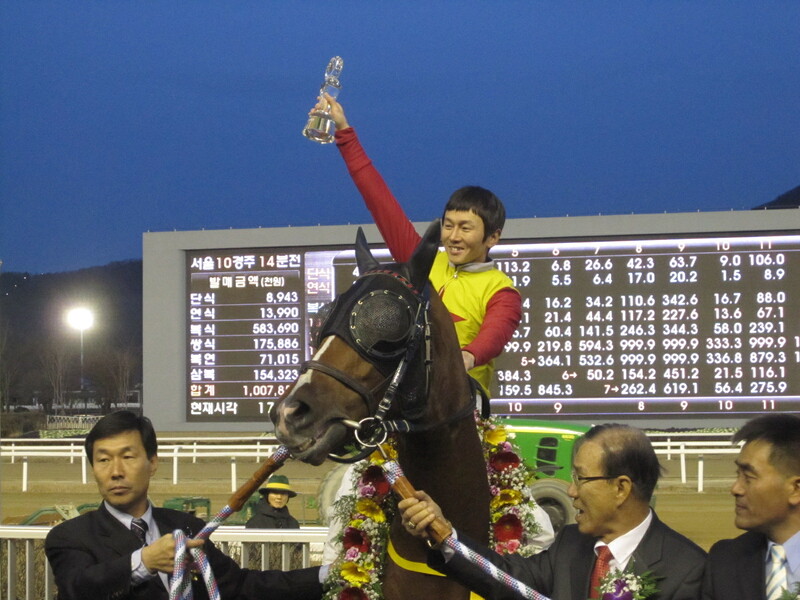 * Yesterday at Seoul, Jigeum I Sungan returned to form with a comfortable victory in the feature race. The 2012 Korean Derby winner, who suffered a shock defeat in the TJK Trophy on international weekend last month, handed Ace Galloper a comfortable 2 length beating to re-confirm his position as the top Korean-bred horse in the capital. * Racing returns quicker than usual next week as Busan’s regular Friday card is brought forward a day to Thursday to coincide with the public holiday. Then all racing eyes will be on Seoul for the weekend and the Minister’s Cup, the final leg of the 2013 Korean Triple Crown. Fausto Durso, who rode at the International Jockey Challenge in Seoul last month, is set to return to Korea for an extended stay after being granted a short-term license at Seoul Race Park. The 39-year-old has spent the last few years racing mostly in Macau and was representing the Macau Jockey Club on his previous visit, during which he won the feature race of the event, the YTN Cup. 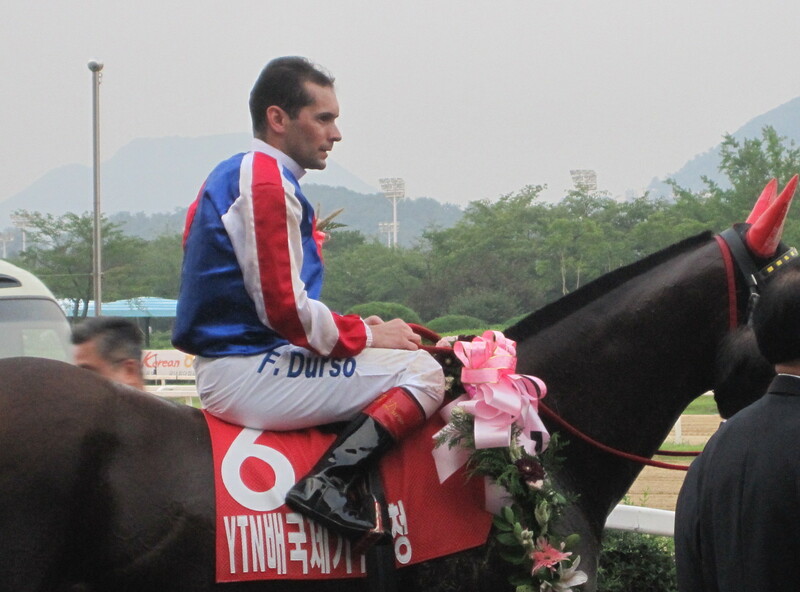 A Sao Paolo native, who racked-up over 700 wins in Brazil before coming to Asia, Durso has ridden more than 600 winners in Macau and has won the Macau Derby. He has also ridden in Dubai and Malaysia. The move is one of an increasing number of interactions between Korean and Macau. Seoul’s champion jockey Moon Se Young spent 3 months riding there earlier this year and Busan champion Jo Sung Gon is set to go soon. Additionally, Korean trainer Seo Beom Seok (also known as Kenny Seo) has set up a stable in Macau with 12 horses which he runs alongside his one at Seoul. In other foreign jockey news, Japanese rider Ikuyasu Kurakane has been granted a 6-month extension to his license beginning October 1. Down at Busan, Britain’s Darryll Holland has also been offered an extension. Meanwhile, Joe Fujii, winner of the Grand Prix Stakes, Korean Derby and Korean Oaks during his time in Korea so far, is in the process of applying to the JRA in his native Japan. After last week’s break for the Chuseok holiday, it’s time to sober up and – several kilos heavier – return to the track as racing resumes in Korea. Big Stakes race of the weekend is the Donga Ilbo Cup at Seoul on Sunday. Next weekend sees the final leg of the Triple Crown, the Minister’s Cup, and the fact that hot 3-year-old filly Joy Lucky (Vicar), whose only in 6 starts came in the Korean Derby, will skip that race in favour of the less valuable but restricted to fillies Donga Cup, suggests that she will take some beating. Cheonnyeon Dongan (Ecton Park) is one who will try along with 12 others in the 9-furlong test. Saturday’s Seoul feature sees a heavyweight clash as Jigeum I Sungan and Ace Galloper face each other. 2012 Korean Derby winner Jigeum I Sungan (Ingrandire) suffered a shock defeat in last month’s TJK Trophy while former KRA Cup Classic winner Ace Galloper (Chapel Royal) returned to the winner’s circle for the 19th time in his last start after a pair of 2nd place finishes. There’s little to choose between them in terms of weight – the older Ace Galloper carrying just a kilo more – and it promises to be a fascinating match-up. Also on Saturday, Charming Girl, 0 for 100, will make her final start before being retired. At Busan, the weekend’s most valuable races are on Sunday. Well-known names such as Road To Prince, Lion Santa and the evergreen 2008 Korean Derby winner Ebony Storm will all be in action. As for foreign jockeys, Ikuyasu Kurakane has plenty of action lined up at Seoul while Joe Fujii (Friday only), Ureshi Katsunori, Masa Tanaka and – fresh from spending his vacation racing around a field in Inner Mongolia – Darryll Holland are riding at Busan. Weekend Preview: No Racing – Happy Chuseok! There is no racing in Korea this weekend due to the Chuseok – “Korean Thanksgiving” – holiday. Things get back to normal next week when the Donga Ilbo Cup will be the highlight at Seoul. Gwanggyo Bisang cruised to a Stakes double at Seoul Race Park today, adding to his Munhwa Ilbo Cup with a 10 length victory in the Ilgan Sports Cup. Sent off the narrow favourite, Gwanggyo Bisang (Menifee) was always prominent among the 13-strong field and, under veteran jockey Park Tae Jong, never looked like being caught as he eased away from his rivals in the home straight. Second-Favourite Heukgisa (A.P.Dancer) ran on for 2nd while the talented but lightly raced and injury prone K-Tap (Menifee) returned a creditable 3rd. As a gelding, Gwanggyo Bisang was ineligible for the Triple Crown races this year. He has now won 7 of his 8 starts and enters class 1 racing as the highest ranked 3-year-old at Seoul. Having won at distances from 1000 metres to 1800 metres, he looks set to among the contenders for big honours later this year. Earlier at Seoul there was a 3rd win in 4 starts for well-thought of 2-year-old Persian Wangja (Ghostzapper). One of very few Canadian-breds in Korea, he suffered his first defeat last time out at the hands of Fly Top Queen in the Singapore Turf Club Trophy. Today, he ran in a comfortable 2-length winner over 7 furlongs and is one to keep an eye on. Down at Busan, having secured his 200th Korean winner last week, Australian Peter Wolsley trained his 201st today, saddling his stable star Cheongchun Bulpae (Milwaukee Brew) to win the feature “Mister Park Memorial Race” by a neck. 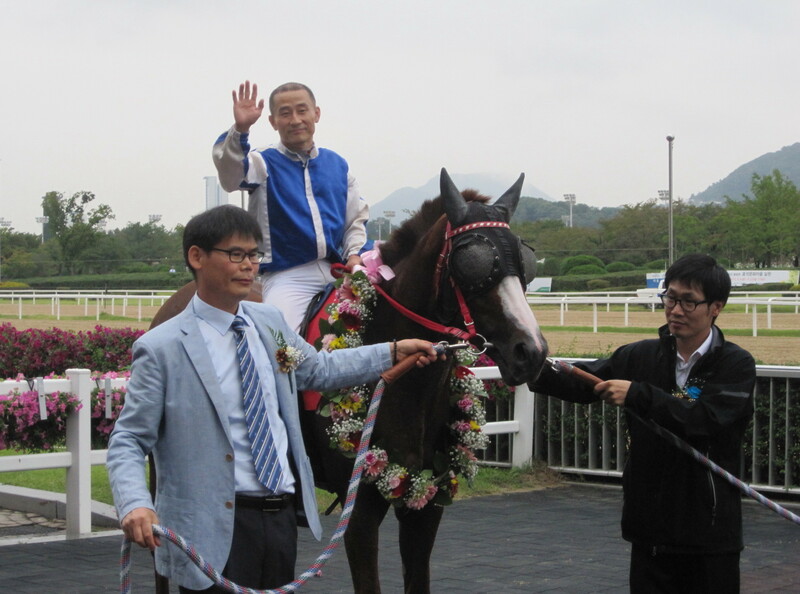 A 4-year-old gelding, Cheongchun Bulpae now has 10 wins from 17 starts. Racing now takes a weekend off for the “Chuseok” (Korean Thanksgiving) holiday. Punters were not impressed to find that the KRA had not supplied gifts for them as is customary at this time of year. However, given that top Korean girl-groups “Dal Shabet” and “Nine Muses” were both in attendance, we will forgive them. The summer weekend evenings of decadence and debauchery are over as racing returns to its normal morning start times this weekend. And sore heads will find plenty to lighten their wallets over in competitive cards at both Seoul and Busan, with the highlight being Seoul’s Ilgan Sports Cup on Sunday afternoon. Gwanggyo Bisang (Menifee) has won 6 of his 7 starts to date, including the Munhwa Ilbo Cup last time out, and despite not having run since that Stakes victory back in July, is set to be favourite for the 1800 metre race, which has attracted a field of 13. The injury-blighted K-Tap (Menifee), who was Seoul’s champion juvenile last year and was 2nd to Gwanggyo Bisang in that Munhwa Ilbo also goes, as do fellow 3-year-olds Blue Camp (Forest Camp) and Like The Sun (Forest Camp). Among the older horses they will face are Sand Jjang (Forest Camp) and Viva Cat (Creek Cat), both proven winners at this level. Also at Seoul on Sunday, highly rated 2-year-old Canadian import Persia Wangja (Ghostzapper) seeks to get back to winning ways after being narrowly defeated by phenom Fly Top Queen last time out. At Busan, the feature race on Sunday in which Peter Wolsley, fresh from saddling his 200th Korean winner last weekend, sends out stable star Cheongchun Bulpae (Milwaukee Brew). 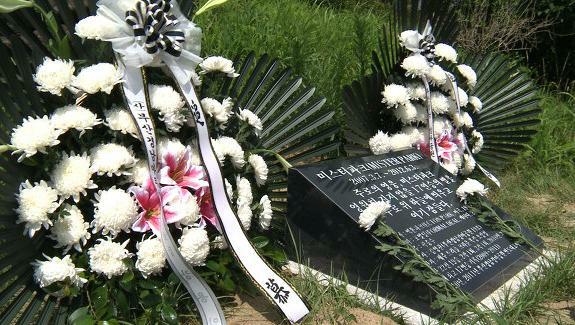 Also at Busan, as reported here, a statue to the late Mister Park will be unveiled on Sunday. On a lighter note at Seoul, top K-Pop group “Dal Shabet” will be performing. 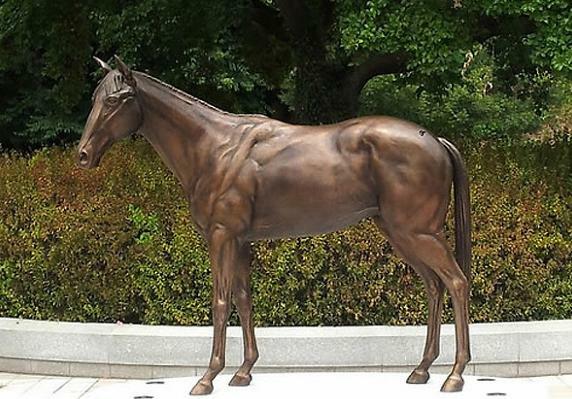 A statue honouring the late Mister Park will be officially unveiled during racing at Busan Race Park this coming Sunday. 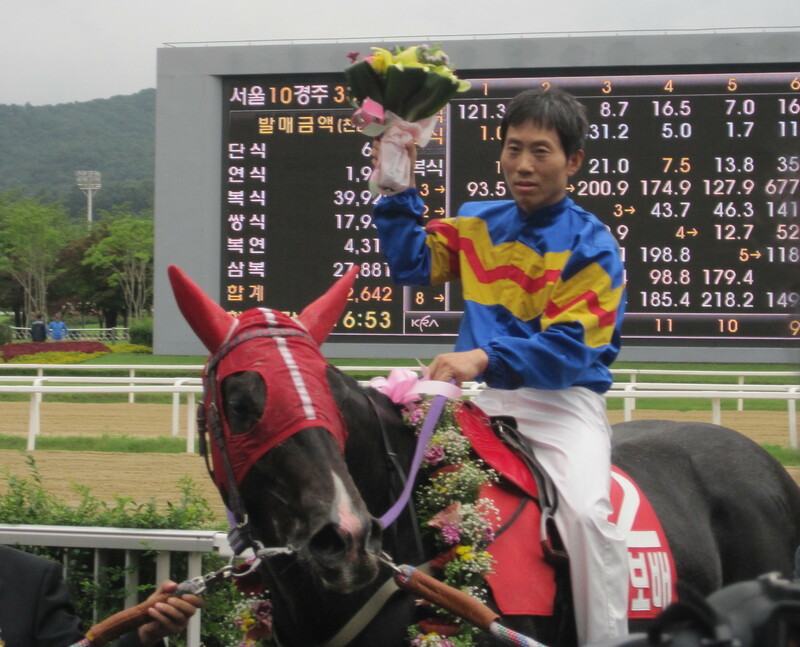 Mister Park (Ecton Park) won the Grand Prix Stakes in 2010 and broke the Korean record for most consecutive victories before suffering a fatal injury in a race at Busan on June 23, 2012. The life-size statue took five months to complete and Mister Park’s owner Kwak Jong Soo will attend to officially dedicate it to his horse. A special booklet “I’m Mister Park” has also been produced for the occasion. 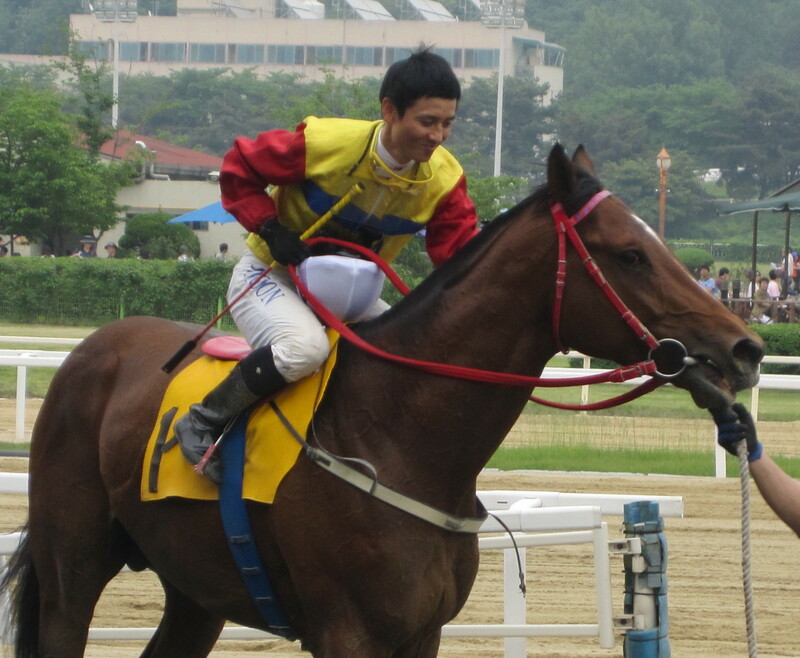 Mister Park, who was 5-years-old when he passed away, ran 22 times, winning on 19 occasions. He was Korean Horse of the Year in 2011. Read more about him here.